North, South, East and West…wanderlust has taken hold, and whether we travel from place to place on holiday, as life demands, or in the virtual world, the idea of exploring will always hold a certain romance. We meld and blend our cultures and traditions to create something new and profoundly beautiful, based on love and a sense of adventure. 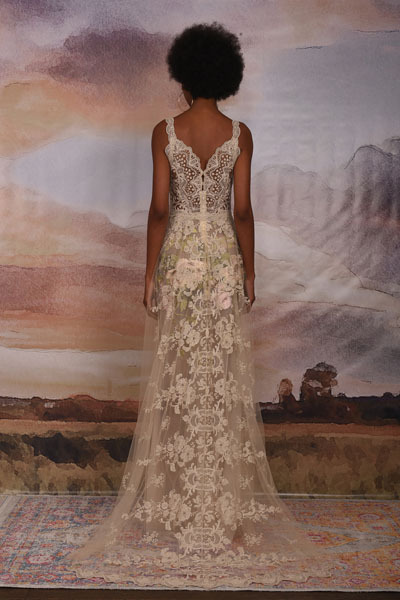 Fabrics are layered, and combined in unexpected ways for a truly unique gown for the bride. Caravan Silver lace with illusion back and flowers with Porcelain silk. 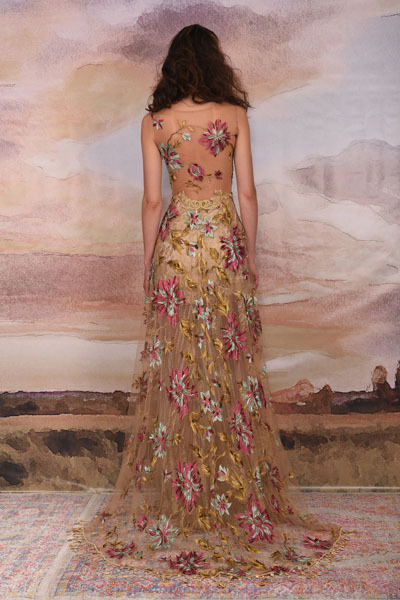 Gypsy Rose Ecru embroidery over floral tulle with embellished rose cape. Horizon Slate shimmer embroidery with silver lace and Pearl silk. 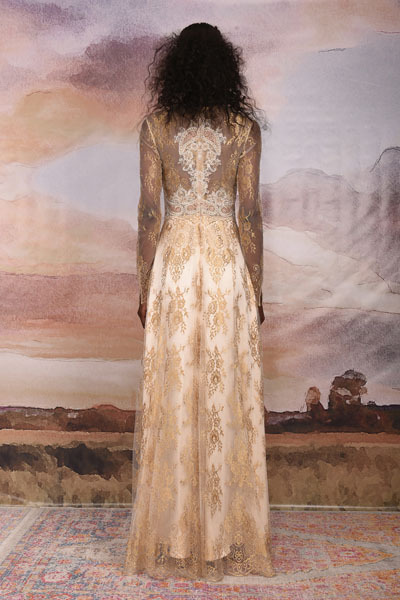 Marrakech Long sleeve Gold Chantilly lace with Blush silk. 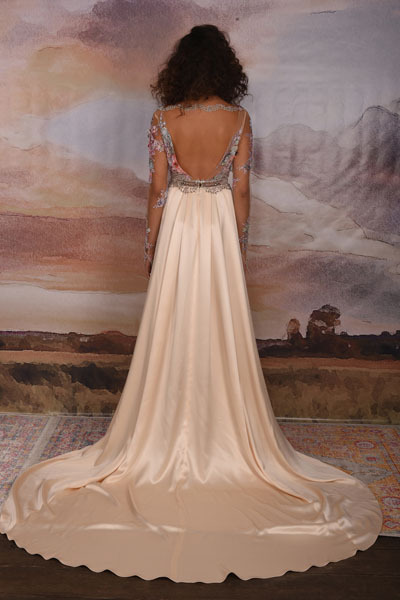 Sahara Grey and Ecru floral embroidery with Mocha silk and tulle sleeves. 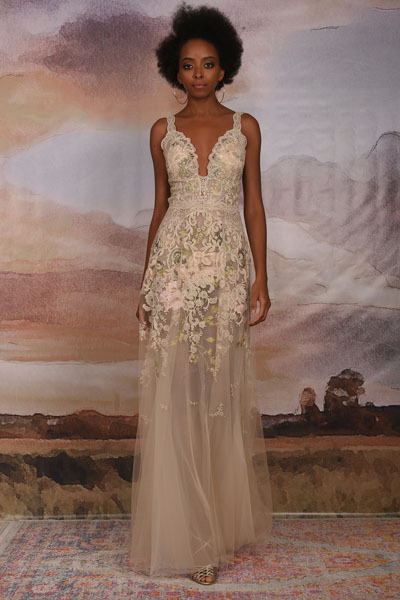 Santorini Multi colored lace beaded flower bodice with Blush silk skirt. Seychelles Iridescent feather embroidery with Porcelain silk. Shangri-La Multi colored embroidery over gold lace with Almond silk. 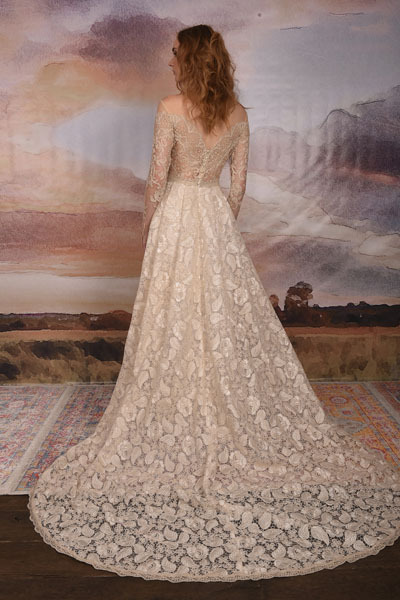 Voyage Ecru corded lace ballgown with illusion sleeves and neckline. To celebrate the concept of global diversity, the beauty team focused on each individual to accentuate their natural beauty. For the look by Make-Up Pro, led by Chika Chan, that meant smoky eyes, and/or a full brow depending on each girl’s features. The skin had a sun-kissed glow, and a natural lip. Hair, led by Kelly DeSerio for Ted Gibson, played with the natural texture, and a few corn-row braids placed to accentuate the face. Wild, strong and beautiful, these brides are ready for the next adventure! 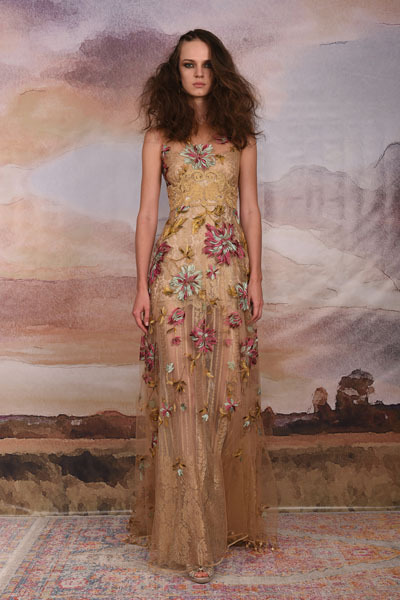 The presentation took place in the Claire Pettibone Pop-up Shop at 345 Bleecker Street. The designer has outfitted the charming salon with vintage furniture from Something Vintage Rentals, eclectic rugs, lush florals, and that effortless mix of luxe-bohemian the designer is known for. 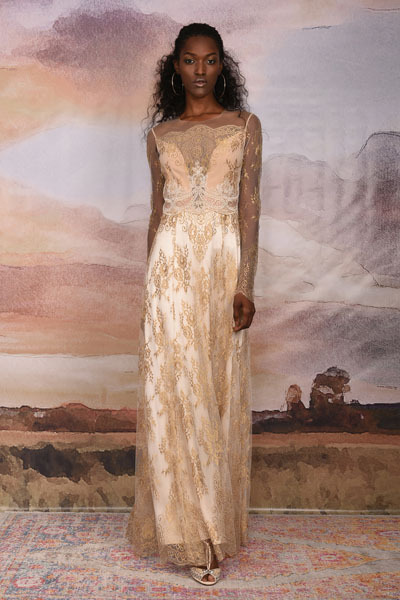 Guests sipped a glass of Moet while perusing the latest couture gowns perfectly paired with Emmy London shoes. The salon also features exquisite veils by Claire, along with a selection of headpieces and jewelry from Twigs & Honey, Erica Elizabeth and Mac & Zoe. 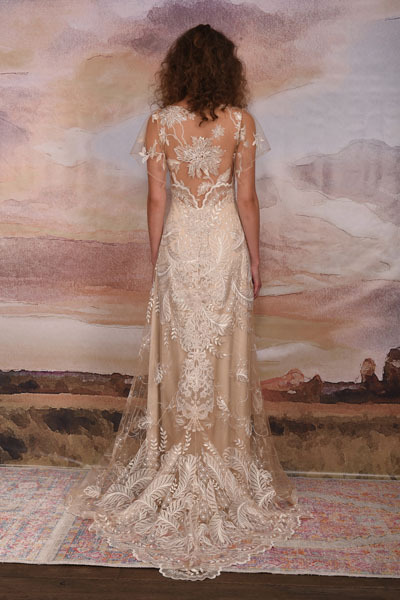 Appointments are available through the end of October for those East Coast brides-to-be looking for a truly unique and stunning gown.